It's time to talk about the why. I think there is nothing more fascinating than understanding why you do something that you do. I've always heard people say they prefer cooking over baking because when cooking you can alter the recipe as you choose and just go where the spirit takes you. While this is true, if you have the proper knowledge and understanding backing up your alterations, you can apply this same technique to baking with excellent results. Since baking is so scientific, you can control very specifically for the results you want. I think that is so cool. Before we get much further into this recipe and/or this blog, I should probably tell you an important fact about myself. I am NOT trying to post quick, easy, 30-min-or-less recipes on this blog. I personally do not search out those recipes, and I am not going to start in an attempt to appeal to a wider audience. Though I don't want to post easy recipes, I do want to make it easier for readers to understand how to follow the more difficult recipes. I want to share the tips I wish I knew before trying the recipe. I want others to feel the same joy I feel during and after a particularly formidable recipe, the satisfaction of looking at an exquisite piece of food and thinking to yourself "I made that." Though these recipes may not be harried weeknight favorites, they will be delicious, and most definitely will be Instagram-worthy. So there's always that. I think the best way to discuss croissant-making is to just break down the recipe. I'm going to post the recipe in its entirety at the bottom, but first I'm going to pull snippets and discuss them. Please don't bake off this discussion part because I'm not going to discuss every single step, just the ones that bear discussing. Please don't get freaked out by how long the recipe is. Take a few minutes to read straight through the thing, from start to finish (which is really what I would recommend doing anytime you bake anything.. I like to read the recipe and visualize myself taking each step), and you'll see that the reason it is so long is because it's quite repetitive. Basically, if you know how to laminate dough, you're golden. And if you don't, you're about to become an expert! Also, heads up, this is a two day recipe. The dough has to rest in the fridge overnight before the final shaping. Please plan ahead. Laminating the dough, which basically means rolling it out and folding it and rolling it out and folding it many, many times to create layers of alternating dough and butter (YUM), is the defining technique of croissants. Without the lamination of the dough, your end product would not be a croissant - though it may resemble a kipferl. Each time you roll out and fold the dough, it's called a turn. Most modern croissant recipes call for three or four turns, which create 27 or 81 layers respectively. However, in Mastering the Art of French Cooking, Julia Child calls for 6 turns of the croissant dough aka 729 layers in total. HOLY SHEET. 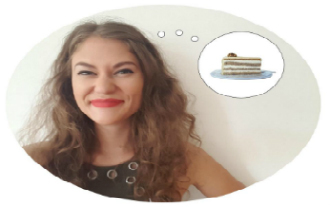 If you are a perfectionist or you aspire to be like Julia (don't we all?) or for some reason you just want to laminate your dough 6 times...don't. What?! Well, here's the deal. Unless you're making giant croissants (like, for example, the amazing croissants at Dan the Baker in Columbus, OH), laminating the dough so many times for a smaller croissant will likely result in a less open crumb. And more importantly for the newer croissant bakers out there, more layers = more opportunities to accidentally tear the dough and cause ***leaky butter***. And no one likes leaky butter. Especially when it completely messes up what would have been perfectly lovely layers of croissants. So for now, lets just stick with a still impressive 27-81 layers of dough and butter. Obviously, flour, butter, and yeast are not the only ingredients. Most of the ingredients are quite straightforward, but these three are more specific and I wanted to explain why. The reason that King Arthur flour (KAF) is specified over other flour brands is because of its protein content. As you may or may not know, the variation in protein content is the main distinguisher between cake flour, all-purpose (AP) flour, bread flour, and high-gluten flour. 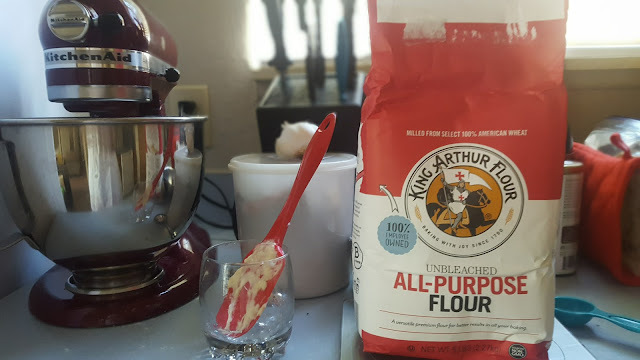 I'm definitely going to do a post on this later because it is fascinating, but for now, suffice it to say, KAF's AP flour has a higher protein content than most AP flours (it's 11.7 percent if you were curious) which is perfect for croissants. It's strong enough to support the many layers but not too strong that you'll break your arms trying to roll it out. The other specified ingredient, European-style butter, is also very important in order to get those distinct layers that we so crave and admire in a croissant. Though European-style is definitely a splurge, it's worth it. European-style butter (I often purchase the Kerrygold brand because that's the only unsalted European-style butter I can find at my local grocery. It must, I repeat, MUST be unsalted.) differs from American-style butter in the fat to water ratio. For butter to be considered butter in the US, by law it must be at least 80 percent butterfat. For European-style, it must be at least 82 percent (some go up to about 86 percent, average is 83 percent). You don't think two percent is worth the extra $3? Flip it around and look at the water content. That's 20 percent vs. 14-18 percent water, a 10-30 percent difference in the total amount of water in the butter. As you may know from pie-dough-making-struggles, too much water = tough pastry. The extra water acts as a binding agent in the dough, which stops the layers from rising as well or becoming as distinct as you may like. 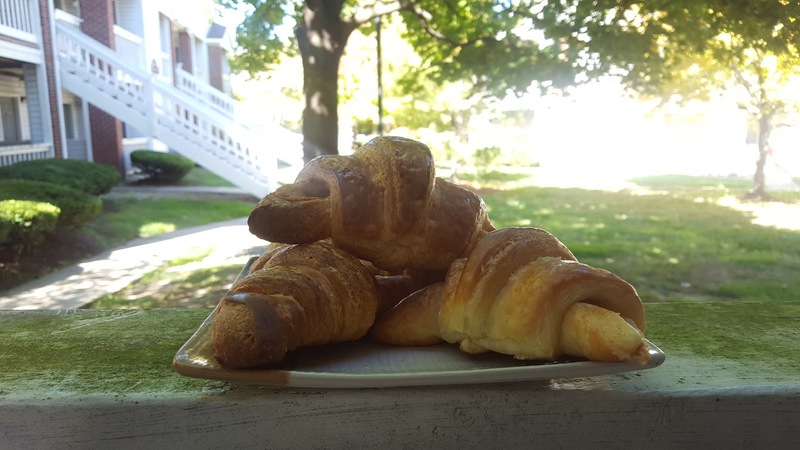 More butterfat also means it will remain solid longer in the oven, again leading to more layers in your croissant. Lastly, the yeast. Please, please, please use instant/rapid-rise yeast (they're basically the same thing). It is SO MUCH EASIER than active dry yeast. This is a topic that I cover in great (probably way too much) detail in a two part series on yeast (part one here and part two here). I don't think anyone should be using active dry anymore. If my generous use of the word 'please' isn't convincing you, consider this: subbing one for the other does not occur at a simple 1:1 ratio so you will A) have to know the ratio or risk messing up your beautiful croissants, and B) have to do MATH to sub in active dry. There- did that sway you?! 2. Whisk in yeast and transfer milk mixture to bowl of a stand mixer. 3. Add the flour, sugar, and salt to the bowl with milk mixture. Using dough hook, knead on low speed until a cohesive dough forms, which should take about 2 to 3 minutes. 4. Increase mixer speed to medium-low and knead for 1 more minute. If you don't own a Kitchenaid or some kind of stand mixer, you're not alone. I spent years baking all sorts of things (including a wedding cake for 200 people) with just a hand mixer and sheer determination. Luckily, making this recipe by hand is a snap. As my grandma always says: "people who knead their own bread and hang their own laundry are more emotionally healthy." Even if you do have a stand mixer, maybe you should knead out some of your stress with this dough. Just go ahead and knead it by hand until it feels smooth and satiny. If that's not specific enough for you, I'd say to knead it for about 7-10 minutes. 1. While the dough chills, fold a 24-inch length of parchment paper in half to make a 12-inch rectangle. Fold over the 3 open sides of the rectangle to form an 8-inch square with enclosed sides. Crease folds firmly. Set aside. I'm going to be honest, the butter block directions seem a little confusing at first. Some recipes take a simpler approach by mixing the dough together, cutting in large chunks of butter, and quickly blitzing it so that the dough is still dotted with large pieces of butter. They will then proceed straight to laminating. While this approach definitely addresses the butter part of the butter block, it does not translate to the same lovely layers in your finished product. Other recipes are not as precise with the measurements of the butter block. However, I find this technique to be quite simple once you actually start doing it, and perfect for matching up the dough/butter ratio correctly. I mean, if you're going to the trouble of spending hours making these things, might as well be precise about it, right? 2. Place 24 tablespoons (12 oz) very cold butter directly on counter and beat with rolling pin for about 60 seconds (or so) until butter is just pliable but not warm. You can then fold butter on itself using a bench scraper and form it roughly into a 6 inch square. Beating the butter is actually very fun! You literally just set out the butter and start whacking it with the rolling pin. (Would not recommend doing this late at night if you share a wall with your neighbors- it's quite loud.) The whole point is to make the butter pliable enough so that you can get it into an 8x8 square and incorporate it into your dough without it melting from being too hot OR cracking from being too cold. 3. Unfold parchment envelope you set aside earlier. Using bench scraper, transfer butter to center of the parchment paper, refolding at creases to enclose. 4. Turn packet over, with flaps underneath, and using a rolling pin on top of the parchment paper, gently roll until butter fills the parchment square. Make sure you have an even thickness. Rolling the butter evenly into every corner of the parchment paper is oddly satisfying. Just trust me.. and let me know if you disagree after you've tried it. 1. After the dough has been in the fridge for at least 2 hours (the original recipe calls for putting the dough in the freezer for 30 min as well, which I would say is optional), transfer dough to lightly floured counter and roll into 17 x 8-inch rectangle with the long side parallel to edge of counter. Use a ruler. No, I'm not kidding. Of course you don't have to, but I've found it very helpful, especially since at this point you are trying to perfectly match up the butter block to the dough. I have a special "baking ruler" which is just a 99c ruler I only use for baking and keep in the kitchen. I've also found the ruler helpful for knocking the sides of the dough so that your sides are straighter and edges are not rounded. 2. Unwrap butter packet and place the butter in center of dough. 3. Fold both sides of dough over butter so they meet in center. Press seam together with fingertips. 4. With rolling pin, press firmly on each open end of the dough and butter packet (top and bottom) to seal edges. Thanks to your RULER, the sides should match up perfectly over the dough! You then want to make sure to seal the edges (by pressing with the rolling pin) so the butter doesn't seep out during the next part. If the butter begins to seep out and get all over the sides of the dough, this will inhibit the rise and distinction of your layers. 5. Roll out lengthwise into a 24 x 8-inch rectangle. Fold into thirds like a business letter, so you get an 8-inch square. You are now beginning your first turn. As I mentioned earlier, a 'turn' is a term used when laminating dough (which is what you are doing now). To complete a turn you will roll out the dough to the prescribed length and width (24 x 8 in this recipe) and then fold it in thirds. That's all there is to it - that's a turn. Easy peasy. This recipe calls for three turns. 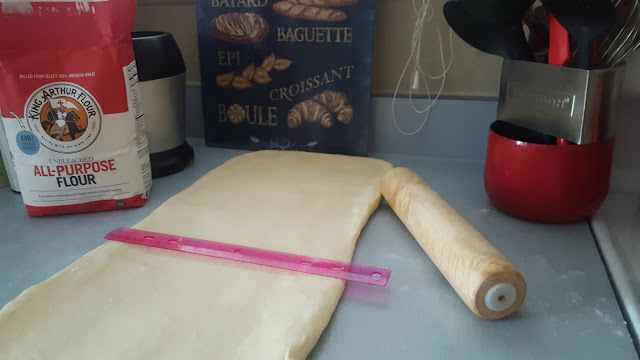 Again, I use a ruler for this- literally roll the dough out to be 24x8 and then all you have to is measure 8 inches in and it will be folded in perfect thirds. While you may choose not to use a ruler, you should still do your darndest to make sure it's folded in even thirds. If you don't, some parts of your dough will not have as many layers as other parts do and the butter will not be as evenly distributed. When you fold the sides of the dough in, letter-style, make sure to brush off any extra flour as you go. We floured the countertop earlier so that the dough wouldn't stick to it, but we want to incorporate as little extra flour as possible into the dough itself - extra flour sitting on top of the dough will mess up those layers! 6. Turn dough 90 degrees counterclockwise. Roll the dough out lengthwise again into 24 x 8-inch rectangle and fold into thirds, again like a business letter. Now you are going to do your second turn. Exactly the same as what we just did. Now there are 9 layers of dough and butter...mmm! 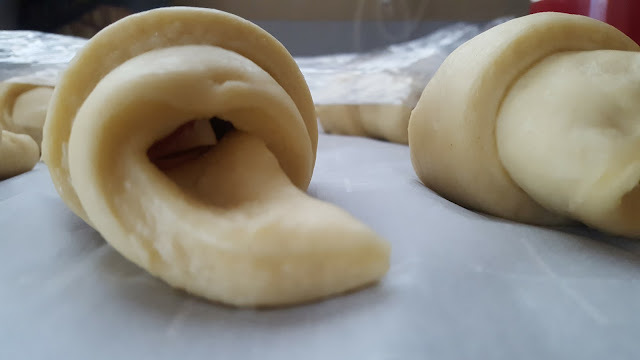 You should expect the dough to be more difficult to roll out with each turn because the strands of gluten within the dough are connecting with each other and becoming stronger as you work with the dough. Just count it as your daily strength training. And you are almost done for the day- you're just going to put the dough in the freezer for a quick 30 minutes because at this point it is probably getting dangerously close to room temperature after those two turns. The last thing we want is a room temp dough, because that means the butter in it is room temp, and that means it's getting ready to melt into the dough and become a cohesive buttery dough, instead of alternating layers of butter and dough. If at any point during this part of the recipe you become concerned your dough is getting too warm, throw it in the fridge or freezer for 20-30 minutes. After your dough has chilled in the freezer, you'll do your last turn- just repeat exactly what you did in the above steps. 2. Generously dust half of the dough with flour. Fold upper half of dough over lower floured half. 3. Using ruler, mark dough at 3-inch intervals along bottom edge with bench scraper (you should have 5 marks). 4. 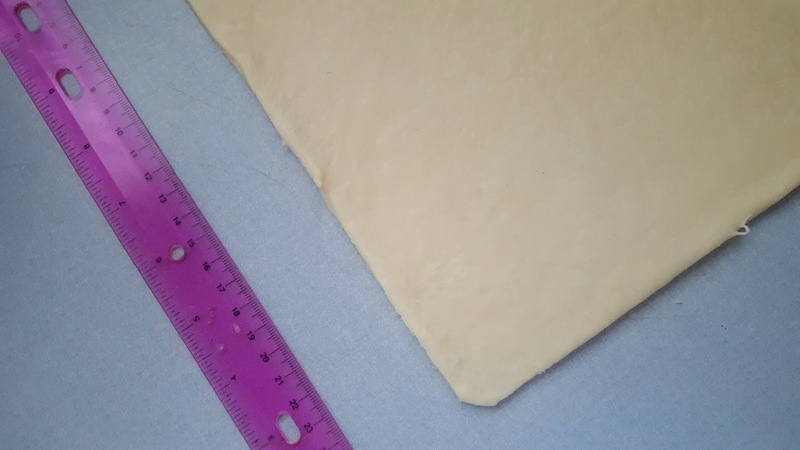 Move ruler to top edge of dough, measure in 1 1/2 inches from left, then use this mark to measure out 3-inch intervals (you should have 6 marks). Alright. This is the part of the recipe where it gets extremely wordy describing a process that won't take more than five minutes. I thought about making it more concise but I find the thorough explanation to be useful. Just read it over before you start and you'll find it's quite simple. Here I will again recommend a ruler.. that is if you want to have uniformly shaped croissants that bake up evenly rather than ending up with some overdone and some underdone. If you don't have a bench scraper to mark the dough with (I highly recommend purchasing one, they are about $5 and useful in many recipes), just use a small knife or pizza wheel. Try to work quickly so the dough stays as cold as possible - you'll thank me in step 6. I filled these particular croissants with prosciutto and gruyere. Mmm. 5. Starting at lower left corner, use sharp pizza wheel, bench scraper, or knife to cut dough from mark to mark. You will have 12 triangles and 5 diamonds. Either discard scraps or place scraps next to each other in a small tart pan to rise. 6. Unfold diamonds and cut in half to make 10 triangles (you will have 22 equal-size triangles in total). I never discard my scraps- I prefer to save them and do whatever I want with with them, such as pressing them into a small tart pan, layering with fillings of choice, and topping with more scraps (and baking up into a deliciously ugly blob). Of course you are welcome to discard them, but it hurts me to think about that expensive European butter and hours of hard work and love being tossed in the trash. When you get to step 6, hopefully you don't have difficulty unfolding the diamonds as I did the first time I made these. If you've been working quickly and you floured the dough well before folding, it should still be cool enough to be fairly differentiated and will separate easily. If not, just work carefully and repeat "I can do this I can do this I can do this" over and over in your head. Or put the dough in the fridge (cover loosely with plastic wrap) for 20 minutes and then try again. 8. Cut 1/2-inch slit in center of short side of triangle. Grasp triangle by 2 corners on either side of slit and stretch gently, then stretch bottom point, again gently. Brush any extra flour off the dough. 9. Place triangle on counter so point is facing you. Fold down both sides of slit. Roll top of triangle partway toward point. Gently grasp point with 1 hand and stretch again. Resume rolling, tucking point underneath. 10. Curve ends gently toward each other to create crescent. Repeat with remaining triangles. 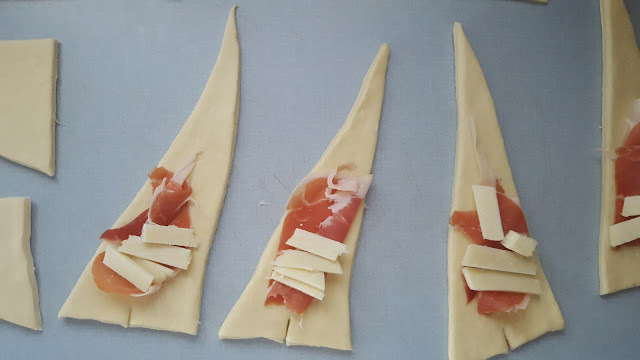 For step 8, you want a cut a small slit at the base of the triangle so that you can fold out from your slit and roll up the croissant in that fashion. This serves to elongate the croissant so that it can take the shape of a classic croissant, with the edges slightly tucked in. If you are more of a visual person, this video is only one minute long and illustrates exactly what I am trying to say. The person in the video places a small piece of dough at the base of the croissant before rolling up - I am not sure why. So you don't need to do that part. However, it is a great visual of where/how you would put fillings such as chocolate or cheese (hopefully cheese) if you were choosing to make filled croissants. 14. In small bowl, whisk together egg, water, and a pinch of salt. 15. Brush croissants with egg wash. Place croissants in hot oven and reduce temperature to 375 degrees F.
To be honest, I often forget about the egg wash when making pastries. In some recipes it makes a big difference in browning, but there is so much butter in this recipe that the croissants have no trouble browning up nicely without any egg wash. However, the egg wash does give the finished product that particular shininess that one associates with the top of pastries, so if that is particularly important to you, by all means, do not forget the egg wash! 16. Bake for 10 minutes, then switch and rotate baking sheets if making 12 croissants. If making only 9 you don't have to worry about rotating pans. Continue to bake until deep golden brown, 8 to 12 minutes longer. Watch carefully so they do not burn. The first few times I made croissants, I struggled not to burn them. I found that they browned within 10 or so minutes but was never quite sure if I should pull them out of the oven because I was concerned they weren't baked all the way through. To this day, I don't think I've ever kept croissants in the oven for more than 15 minutes or 20 at the most. If your croissants are browning too quickly, try covering them loosely with aluminum foil and continue baking. And that's pretty much all there is to it for croissants! There is a note at the end of the recipe about freezing some of them prior to proofing and baking, which I usually do because, as much as I'd like to, I can't eat 22 croissants in two days. Sadly, I've always felt like there is a pretty fair difference in quality between the croissants baked immediately and those that are frozen, thawed, proofed, and baked. If you have success with the frozen ones, please share your secrets with me! The recipe I outlined above and am sharing below is actually the first croissant recipe I ever made. It's adapted from a recipe created by America's Test Kitchen. I really appreciate how clearly they spell out the directions and really walk you through the recipe. Though I enjoy experimenting with croissant recipes from some of my other most trusted baking websites (Serious Eats, The Kitchn, King Arthur Flour), this is the one I always come back to - it feels familiar, comfortable. Hopefully it can be that for you as well. 1. Over low heat, melt the 3 tablespoons butter in a medium saucepan. Remove pan from heat and immediately stir in milk (the temperature should be lower than 90 degrees F ). 5. Remove bowl from mixer and cover with plastic wrap. 6. Let dough rest at room temperature 30 minutes. 8. Pat the dough (using your fingertips) into 10 x 7-inch rectangle about 1 inch thick. 9. Wrap dough tightly with plastic and refrigerate for 2 hours. 5. Refrigerate butter packet at least 45 minutes. 7. Place dough on a parchment paper (or cookie sheet), and wrap it tightly with plastic. 8. Place dough in freezer for 30 minutes. 9. After 30 minutes, transfer dough from freezer to a lightly floured counter, so that top flap opens on right. 10. Roll out dough lengthwise into 24 x 8-inch rectangle and fold into thirds. 11. Place dough on sheet, wrap tightly with plastic, and refrigerate for 2 hours or up to 24 hours, preferably overnight. 30 minutes before you are ready to begin shaping, throw the dough in the freezer. This will keep the dough from reaching room temperature as quickly during the shaping process. 1. After 30 minutes in the freezer, remove and transfer dough to a lightly floured counter. Roll into 18 x 16-inch rectangle with long side of rectangle parallel to edge of counter. Go all around the rectangle and cut off just the very edges. 10. Curve ends gently toward each other to create a crescent shape. Repeat with remaining triangles. 11. Place 9 shaped croissants on a parchment lined sheet (or 12 croissants on 2 parchment-lined sheets) at least 2 1/2 inches apart. 12. Lightly wrap with plastic. Let stand at room temperature (70 degrees F is ideal) until nearly doubled in size, 2 1/2 to 3 hours. The rest of the shaped croissants can be refrigerated for up to 18 hours. Remove from refrigerator to rise and add at least 30 minutes to rising time. You can also freeze the rest of the shaped croissants (see make ahead note at the end of the recipe). 13. After croissants have been rising for about 2 1/2 hours (or until croissants have almost doubled), preheat oven to 400 and adjust oven rack to be in the middle if making only 9 croissants and using 1 sheet. If making 12 croissants and using 2 sheets, adjust oven racks to upper-middle and lower-middle positions. 17. Transfer croissants to wire rack and cool about 15 minutes. Serve warm or at room temperature. TO MAKE AHEAD: see step 12 above. 1. Directly after shaping, place the croissants you wish to freeze on parchment-lined sheet 1 inch apart. 2. Wrap with plastic and freeze until solid, about 2 hours. 3. Transfer to zipper-lock bag and freeze for up to 2 months. 4. Bake frozen croissants as directed from step 11, increasing rising time by to 2 hours, or as needed to double in size. **Disclaimer: All opinions expressed in this post are mine alone. I am in no way affiliated with any of the baking websites mentioned in this post.